13 cm/5"tall .Dollhouse man, driver/chauffoer with molded decorated brown hat and matching gloves. This is a fine dollhouse man, dressed as a driver in a brown felt suit with a white shirt and tie. Fine original condition.No cracks. Very nice painted.. Also good as a Driver for a Tinplate car. Lovely Dollhouse girl, Kling ca 1890. Working child! BING Tin Kitchen table w. matching chair. 3 3/4" x 3 3/4" (10 x 10 cm is this lovely tinplate kitchen working table with matching chair made by Bing ca 1890. Lovely Litho to simulate wood and fine pattern engraved at the back of this table. This was mostly used as a baking table in the kitchen. The matching chair has a heart in the back of the hear shaped chair. A lovely set for the Kitchen! Schöner Blech Küchenmöbeln. 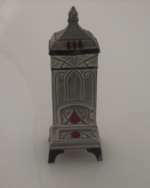 4" /10 cm high.A fine Pewter Stove from ca 1890. Casted metal. Fine Art Nuveau desigs on all sides. Inlaid red metallic painting to simulate heat. Stand on 4 black feet.Fine for a smaller dollhouse or roombox. Near Mint condition. Lovely in a samall scale blue roof house . 1 1/2" ( 2 cam) is this rare dollhouse Victorian needle box for the dollhouse. Lovely decorated paper machee. Lid to open to see the sewing utensils. Ca 1880. What a neat item for the antique house!Also a nice accessry for a French Fashion! 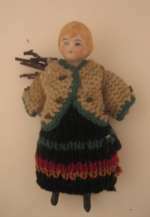 15 cm tall is this rare very early Dollhouse Gentleman. His head is made of Wax with inset pupilless eyes. His body and limps are carved and turned wood He date from ca 1780. All original dressed. An outstanding doll for a very early house.Museums piece. 13 Tall doll house lady from 1770. Wax head with inset bean eyes, wig, molded facial features.Body and arms made and wood. She is dressed in her original antique green silk dress a little distressed in the silk. Otherwise the doll is wonderful and very rare. Perfect for a very old house.